The three Action Planner® tabbed sections clearly separate To-do’s, Notes and Special information for more list making, better organization and a feeling of accomplishment. 12 month date range January - December is easy to manage. Julian dates. Two page per week layout. Left half of each day is designated for hourly appointments from 8:00 a.m. - 6:00 p.m. to keep track of a full day of meetings. Second half of each day is designated for notes and to-do's to help keep the hourly appointments neat. 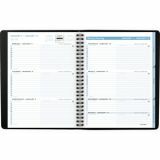 AT-A-GLANCE The Action Planner Weekly Appointment Book, 6 7/8 x 8 3/4, Black, 2019 - Weekly Action Planner features tabbed sections for appointments, to dos, notes and special information including 800 numbers, future planning, web addresses, four-color world map. Displays each week on two-page spreads with past, current and future reference blocks and Julian dates. 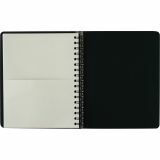 Designates half of each day for meetings/appointments and the rest for to do messages, notes and lists. Hourly appointments range from 8 AM to 5 PM. 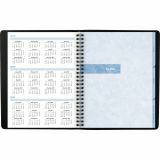 Planner offers simulated leather cover. Includes storage pocket. Nonrefillable. Past, current and future month calendars shown for quick reference. Special information tab includes pages with toll free contact numbers, web addresses, a four-color world map and future planning pages. Storage pocket included to stash loose sheets. 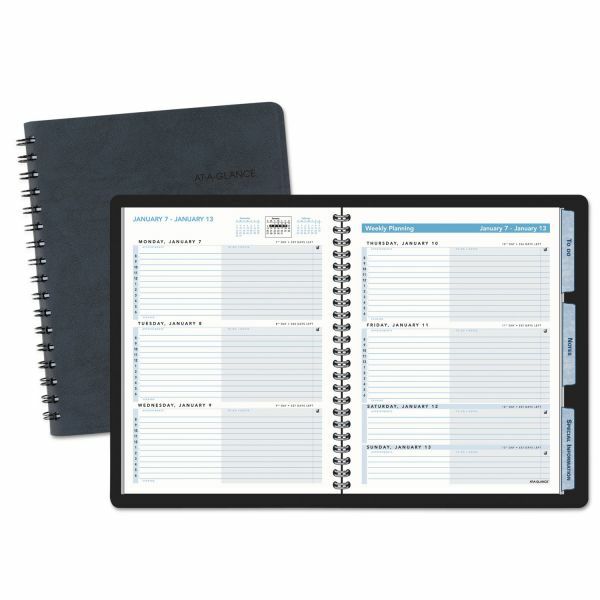 Appointment book/planner pages are made from high quality paper containing 30% post-consumer recycled material. 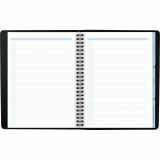 Wirebound design with 6 7/8" x 8 3/4"pages. 7 3/4" x 9 1/8" x 5/8"overall size. 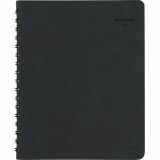 Black, suedelike planner cover has a soft feel and is very durable.